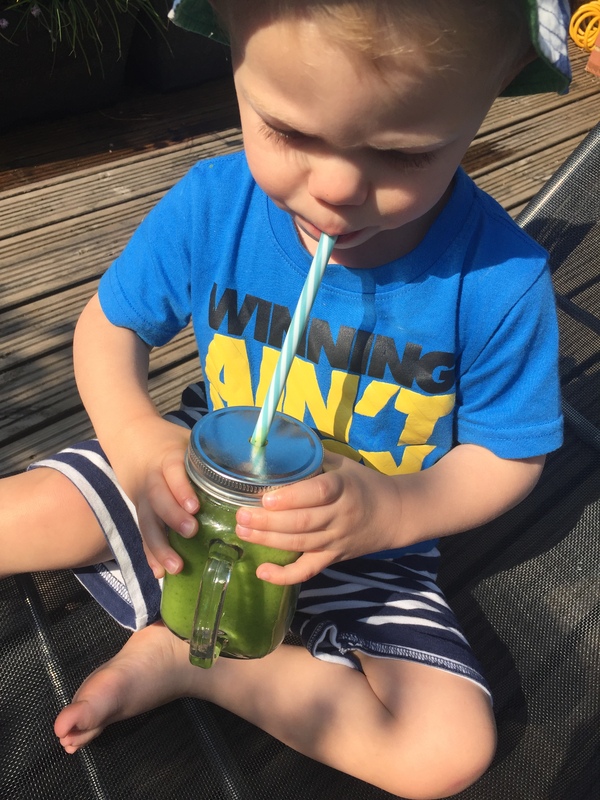 However, with a rather finicky child when it comes to veggies, especially green veggies, I find making a smoothie is an easy way to get some green veggie power into him and he is none the wiser. In fact, he thinks it’s a real treat! I score that one nil to Mum. The only thing is, he does seem to prefer us getting smoothies out than at home. It’s like he wants to see me hand over the cash. 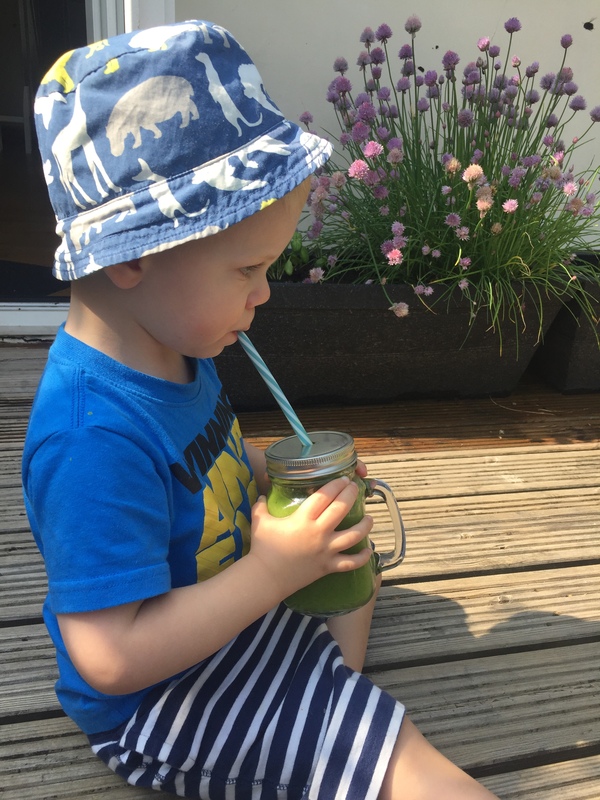 I suppose it’s better that way round than me buying him smoothies (which are extortionate and must have almost as much mark-up as coffee) and him not drinking them. Although, there would be more for me that way. I’ve been making banana ice cream a lot for Seb, which is a lot like soft serve in texture and has the bonus of just needing one ingredient, frozen bananas. But not everyone is mad keen on bananas, but most can’t say no to ice cream. 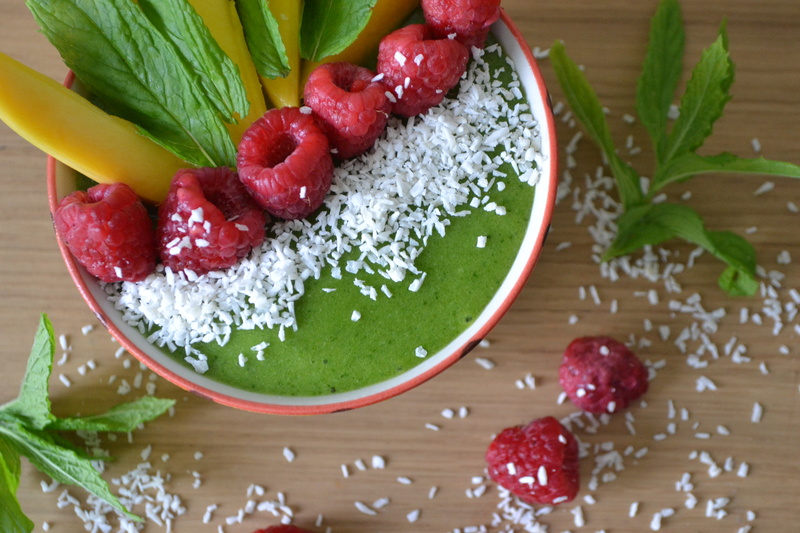 By adding the mango and mint, it totally masks the banana taste and just delivers a truly refreshing flavour ice cream or as it’s now called… smoothie bowl! The main difference between a smoothie and a smoothie bowl, from what I can gather is that the you can eat a smoothie bowl with a spoon as it’s a little thicker due to the extra bananas thrown in. 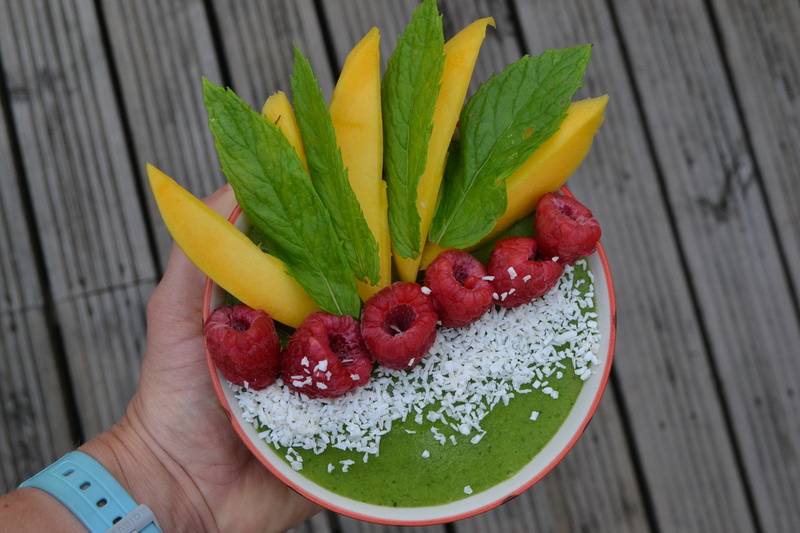 And of course let’s not be forgetting the toppings you can put on a smoothie bowl. If I’m truly honest, it’s always about the toppings and the more the merrier. 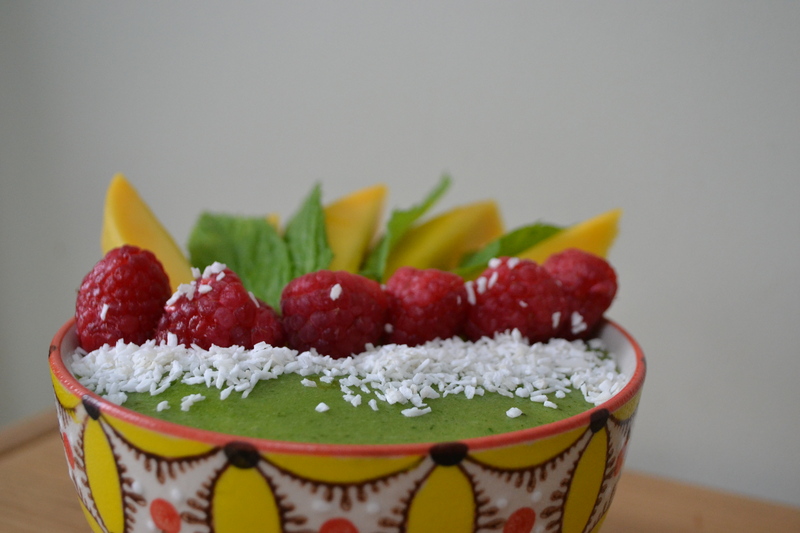 For this smoothie bowl I decided some contrast colours would look inviting and they came in the form of extra sunshine mango, tart raspberries and sweet dessicated coconut as a little crunch on top. The spinach flavor is totally masked by all the other clean summer flavours, so just chuck it in and don’t be shy about it. This is the perfect summer time breakfast, afternoon drink, after BBQ pudding. It’s an all rounder and your kids will fight you for it. Chuck everything in your blender / nutribullet and blend till you have reached your desired consistency. If you’d like it thinner to make it drinkable, just add more water and some ice. 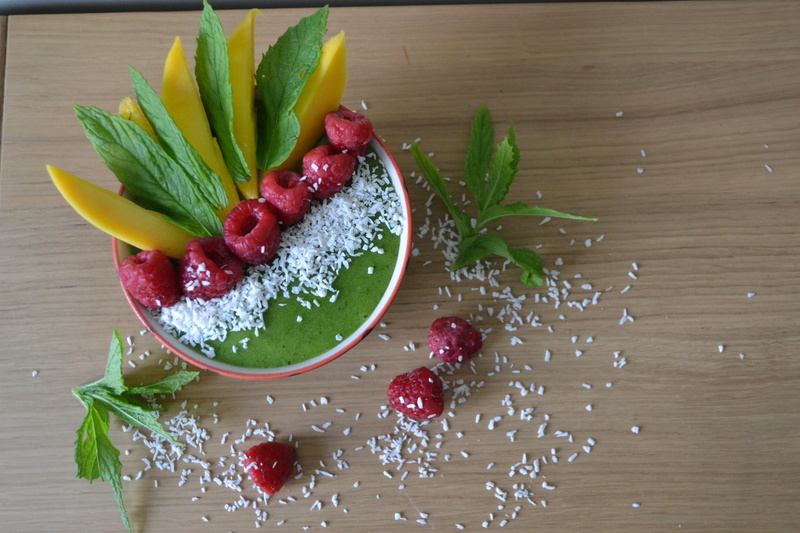 This entry was posted in Breakfast, Desserts, Dinner, Lunch, Recipes, Smoothies, Snacks and tagged Banana, Mango, Mint, Raspberry, Smoothie bowl, Smoothies. Bookmark the permalink.